Since most Boat Covers are used outdoors, they are exposed to everything mother nature has to offer. Sun, Rain, Sleet, Snow, Wind, etc. In order for any cover to do its job, it must be supported properly to allow proper drainage. Allowing even the smallest amounts of water to accumulate on a boat cover can create problems with the cover and in some cases the boat itself. Here, you can see a picture of an improperly supported cover. When a cover is allowed to accumulate water like the picture you've just seen, water will leak through the sewn seams of ANY fabric, even Sunbrella! As the weight of the water continues to pull the entire cover into the boat, the straps tend to detach from a cover, the fabric stretches to it's limits allowing water to penetrate, and the seams where the cover is sewn together can separate. What about the dirt and grime accumulating in the puddle on the cover? This creates stains (like a bathtub ring) and the organisms that will grow in the puddle literally "Eat" the fabric (heck they gotta eat too), making the fabric weak in the area of the puddle. A cover that should have lasted a few years will fail prematurely if allowed to "sink" into the boat for even a few weeks or so. Manufacturers of Boat Covers and customers have come up with many ideas to support a cover. One of our favorites is the the guy who stores his roto-tiller in the boat cause he can't use either one of them during the off season! The "standard" methods of available cover support options are listed below. Wooden or fiberglass battens tensioned into an "arch" width-ways on the boat. These work quite well but tend to be a bit pricey and mounting hardware must be installed on the boat which puts more holes in the boat. 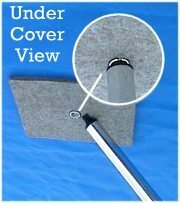 Aluminum support poles (usually adjustable) with a peg for a brass grommet that is installed in the cover. Good concept if the grommet is set into a reinforced pad sewn-in at the factory at the exact location where support is required for a specific boat. This requires a customer provided measurement. Water leaking into the boat through the grommet hole is also common. Aluminum support poles (usually adjustable) with a rubber tip to poke the cover from below. Having no lateral support, these tend to fall over easily. In order to provide enough downward pressure on the pole to hold it in a vertical position, the straps of the cover must be tensioned excessively. You can see a typical result of this type of pressure HERE. Webbing Systems. Overall, a Great Idea! They work well for long term storage of the boat. Some models take quite a bit of time to set up and install. Price tends to be prohibitive on the effective units. Ameri-Snap-Pad Support System. Of course we're going to tell you that this is the best thing since sliced bread. We'll as far as boat covers are concerned, it is! When the major catalog houses call and want to carry your product and other boat cover manufacturers keep calling wanting to "Buy Us Out" we think we're really on to something. You be the judge. First we use an Adjustable Support Pole with the male end of a large snap on the end. You can see one HERE. They adjust from 40 to 70 inches. The proper height is "locked-in" with the use of a thumb-screw type knob. The bottom of the pole has a crutch-style tip to keep the lower portion from slipping out of place on the floor of the boat. Then we invented the Ameri-Snap-Pad as shown HERE. They're a full 1/4" THICK, GENUINE FELT and come with our specially formulated adhesive already bonded to the pad. This adhesive is protected from contamination and premature drying with a peel-n-stick backing which is removed prior to installation on your new cover. Our specially formulated adhesive is water-proof and forms an excellent, permanent bond of the Ameri-Snap-Pad to the underside of your new boat cover. Then we install a large Snap into the center of the pad. The support pole actually snaps into the pad to keep it perfectly aligned and in place. A view of the pad and snap system can be seen at this LOCATION. There's a picture of one installed HERE. To see a properly supported boat cover, please click HERE. The price is right! $$$ Find Prices Here $$$. You place the support exactly where you need it for your particular boat. The support pole stays perfectly in place, even while towing! No leaks through the cover where pole is pushing upward. Heavy felt pad distributes strain of pole evenly on underside of cover. No ripping or tearing of fabric from the pole's upward pressure. Your Cover Needs Support, Why settle for less? Installation of our Ameri-Snap-Pads is easy. First place your cover over the boat. Center the cover and then crawl into the boat (under the cover) to find the exact spot your particular cover needs to be supported to gain the best drainage possible. Take a pencil and the Ameri-Snap-Pad into the boat with you. Mark the best spot as shown HERE. You'll probably want to have someone outside of the boat "spot" for you to help you determine the best location for the Ameri-Snap-Pad. Remove the cover from the boat and get momma's hair dryer. Flip the cover over and remove the peel-n-stick backing from the Ameri-Snap-Pad. Align the pad with your pencil marks and press into place. Flip the cover over again and apply heat with the hair dryer. Heat the pad for about 15 seconds or so and it will bond to the cover. Wait for the pad to cool before using the cover. That's all there is to it! Pricing for the Ameri-Snap-Pad Support System can be found under our Boat Cover Accessories Section. You can purchase them online with your new boat cover.